As Hallowe’en is coming around again I thought it was timely to write a post on the films that scared me. I grew up loving horror films and with two elder siblings, parents that indulged my horrific interests and Friday night horrors being a weekly tv occurence I watched quite a lot! This isn’t my scariest films of all time list, and some people might look at these and wonder what I was talking about, but for various reasons they are films that stuck with me. 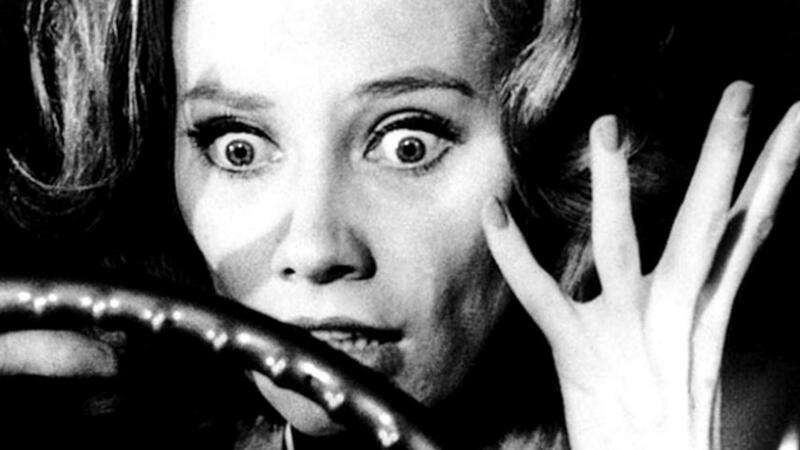 Carnival of Souls This 1962 film directed by Herk Hervey still scares me more than anything. Typically enough I watched it on my own on a stormy night with only the dog for company and I couldn’t look out a window at night for about a month after. It inspired Romero’s Night of the Living Dead and as far as I can see, the entire cinematic career of David Lynch. The director does a fantastic job creating some of the most eerie scenes I’ve ever seen on film and also pops up in a highly disturbing role. You won’t want to look out the window or listen to an organ for some time after viewing this. The Haunting (1963) If you have seen the dire Liam Neeson, Catherine Zeta Jones remake, don’t let it colour your opinion, this is one of the finest haunted house and indeed horror films ever made. It is a brilliant adaptation of the already terrifying novel by Shirley Jackson surrounding a diverse group of people attempting to prove the existence of the supernatural in an “evil” house. It’s a classic what you don’t see film and one scene will have you biting your nails using sound alone. An absolute must. Twilight Zone The Movie (1983) I was reared on horror suspense television series like the Twilight Zone, Tales of the Unexpected and Alfred Hitchcock Presents. A lot of these kept me up at night with their uniformly horrible endings for morally dubious protagonists but the Twilight Zone movie was one which really stuck with me. Looking back at it now only three segments really stand out, the Prologue with Dan “want to see something scary?” Ackroyd, the story about the horrificallly omnipotent child with the innocuous title “It’s a Good Life” (which takes on a far greater relevance when you live with a dictatorial toddler) and the infamous “Nightmare at 20,000 Feet”. Without giving too much away for those who haven’t seen it I will just say mouthless girl, demonic bunny and gremlin, gremlin, gremlin. The Innocents (1961) Henry James’ hugely unsettling Turn of the Screw has been adapted a number of times (once with Patsy Kensit horrifically enough) but never as effectively or as disturbingly as this 1961 version directed by Jack Clayton and starring Deborah Kerr. A tale of a nanny who believes her charges may be possessed by malign spirits, it is filled with a looming sense of dread culminating in horrific events. It contains quite a few jump and shudder moments, particularly scenes involving the appearances of Quint, although the knowledge that he’s played by Peter Wyngarde (super camp Jason King) comforts me somewhat. The Creeping Flesh (1973) I have only ever seen The Creeping Flesh once, I was quite young and up in a friend’s house watching the Deadly Ernest Horror Show (eighties alert) when we shouldn’t have been and it scared me witless. It stars the wonderful Peter Cushing and Christopher Lee and concerns a superbly creepy deformed skeleton which yes, grows flesh. I suspect it might not terrify me so much if I watched it now but I still feel queasy remembering the first time you see the reanimated fleshy skeleton and frankly, I don’t know that I want to see it again. Poltergeist II: The Other Side (1986) Poltergeist is a great film and pretty scary, I hated that clown doll and dragging a small child into a television is fairly creepy but nothing in it terrified as much as the Reverend Kane in Poltergeist 2. Overall the film is patchy but he is a genuinely terrifying character, wonderfully played by Julian Beck and, in the stories of his apocalyptic cult, just that little bit plausible (if you take away the whole haunting bit). Apparently Beck was terminally ill at the time of filming and he has the look and pallor of someone quite close to death which makes it all the more unsettling. It is also worth a look for the Giger created tequila worm monster! The Amityville Horror (1979) So “true” horror stories are two a penny nowadays but back in the late seventies and early eighties we were all far more gullible and really took the whole Indian burial ground thing on board. The Amityville Horror scared the daylights out of me, most notably the red eyes at the window and the babysitter trapped in the wardrobe. It also boasts Rod Steiger as a scene stealing priest “for God’s sake get out!”. The Orphanage, creeped me out completely and stuck in my head for a lot longer than I liked. Yeah, that was a freaky one. I guess the ones you see as a kid have the biggest effect though. You must see Babadook. It’s lots of fun!